Happy Saints: NEW! Happy Saints eBook 8! 20% Launch Discount! 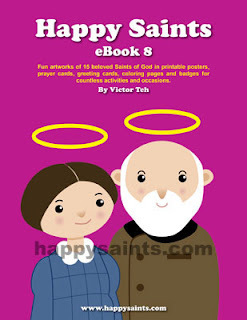 Happy Saints eBook 8 is now available! This ebook features 15 completely new and never-seen-before saints artworks in printable posters, prayer cards, greeting cards, coloring pages and badges! Purchase it now and get a 20% launch discount! Valid until 1 July 2015 only. Enter promo code HAPPY8 at checkout!